Summer Undergraduate Research Awards Application is OPEN! The School of MCB and the Departments of Biochemistry and Microbiology are excited to announce we have begun accepting applications for our Summer Undergraduate Research Awards. Continuing Students interested in applying should use this common application form. Students may be eligible for multiple awards, but each student may only accept one. Eligibility requirements for each award can be found on our web site. Awards range from $2,000 to $5,000 and most will be paid via an hourly 10-week appointment. Please complete the application in its entirety and submit prior to the deadline, Monday, February 13, 2017, at 5:00 PM, for full consideration. One-page proposal (excluding any necessary referrences) of research to be conducted, saved and uploaded as a PDF. The proposal should be typed using 11 point Arial font (or equivalent), single-spaced with 0.5 inch margins on all sides and includea title/topic of research project. It should describe the overall goals and objective of the project along with the work that will be undertaken by the student. This document should be an original and professional document prepared by the student with input from the principal investigator (P.I.) of the laboratory. Unofficial undergraduate transcript available from Enterprise Student Self-Service, saved and uploaded as a PDF. Nomination letter from Principle Investigator (PI) supporting the applicant’s research, uploaded as a PDF at the following site, http://go.illinois.edu/sroprec. Required for Microbiology Awards only. Recommendation letter from your direct mentor (supervising graduate student or post doc), who can critically comment on the research you have already conducted in the Microbiology faculty member’s laboratory. The National and International Scholarships Program is offering a two-day event about the Harry S. Truman Scholarship. The Truman Scholarship offers $30,000 towards graduate study in public service fields. Only Juniors are eligible for the award. On October 13, attendants will receive an overview of the scholarship as well as get to talk to a former Truman Scholarship recipient from UI. On October 14, the Scholarships Program will offer a workshop on how to write a competitive scholarship packet. Students are encouraged to attend both events. Thursday, Oct. 13th, 3:30-4:30 Information session & discussion w/ former Truman Scholar. Friday, Oct. 14th, 3:30-4:30 Workshop on how to craft a Truman Application. *Both sessions held in the Illini Union Bookstore, 5th Floor, Rm 514. Applicants will be notified via e-mail when applications are received. Semifinalists will be interviewed January 21 or 28. Winners will be honored at a Scholarship Awards Brunch on March 4, 2017. Ever considered traveling somewhere our of the ordinary after graduation or during your graduate studies? What about gaining valuable international work experience in your area of study? If interested, please contact David Schug or Jeff Yockey, National and International Scholarships Program, 807 South Wright Street, Fifth Floor, Illini Union Bookstore, MC-317 or at topscholars@illinois.edu or (217) 333-4710. The campus deadline for completed applications (including official transcripts from all college and graduate work and four letters of recommendation) is noon on Thursday, September 22, 2016. The National and International Scholarships Program is also willing to review your application materials in order to provide you feedback prior to the September 22 deadline. The Annual Biomedical Research Conference for Minority Students (ABRCMS) is the largest, professional conference for minority students, including those with disabilities and US military veterans, encouraging them to pursue advanced training in science, technology, engineering and mathematics (STEM). This year ABRCMS will be held in Tampa, Florida on November 9-12. ABRCMS is currently accepting abstract submissions and applications for the student travel awards. MCB undergrads, please consider applying if you are interested! The application deadline is August 26, 2016. Tutor the People is offering a scholarship for pre-med students across the country. The scholarship asks students to submit an essay that illustrates how an MD degree will help them achieve their life goals. They will award a $1,000 prize to the winning submission, which will be made payable to that student’s current university or future medical school. The P.E.O. Educational Loan Fund was established in 1907 and makes loans available to qualified women who desire higher education and are in need of financial assistance. No installment may be drawn by a first year student in a two-year program until she has satisfactorily completed at least one semester, trimester or quarter of college work, or a grading period in a non-collegiate program. The $1,500 Hauser scholarship seeks to support LAS undergraduates who have a full sibling with Down syndrome. Applicants should demonstrate their experience with people with disabilities—especially Down syndrome—and complete a 500-word essay on their relationship with their sibling. Applicants are encouraged to learn more about the Hausers and their generous gift. The scholarship is renewable for up to 3 years as long as the recipient continues to meet eligibility criteria. Applications are due by Wednesday, June 1 at 11:59PM. All applications must be submitted electronically through this form: https://illinois.edu/fb/sec/7367223. Questions? Contact LAS Honors at lashonors@illinois.edu or 217.333.1158. The Younger scholarship was established to memorialize Diana B. Younger who was a tireless supporter of education during her lifetime. The $3,300 scholarship aims to assist students who have worked to support themselves and is renewable for up to 3 years as long as the recipient continues to meet eligibility criteria. All applications must be submitted electronically through this form: https://illinois.edu/fb/sec/9921093. The local branch of the American Association of University Women (AAUW) will select a qualifying undergraduate student to receive the Ida King Stevens Award. The Ida King Stevens Award is intended to help returning women students complete their education. The scholarship awards $1000 (500 each semester) toward the recipient’s tuition and fees. The recipient will be contacted to participate in appropriate AAUW Branch activities. Be a resident of the state of Illinois (as defined by the UIUC standard for in-state tuition). *Have experienced an interruption in formal education of at least two years. (See below for explanation)?4. Be enrolled in an undergraduate program at the University of Illinois at Urbana-Champaign as either as a full-time or part-time student. A student drops out of community college to care for an ailing parent. A college student has a child and decides to postpone the completion of her degree. A high school graduate works full-time to save enough money to go to college. 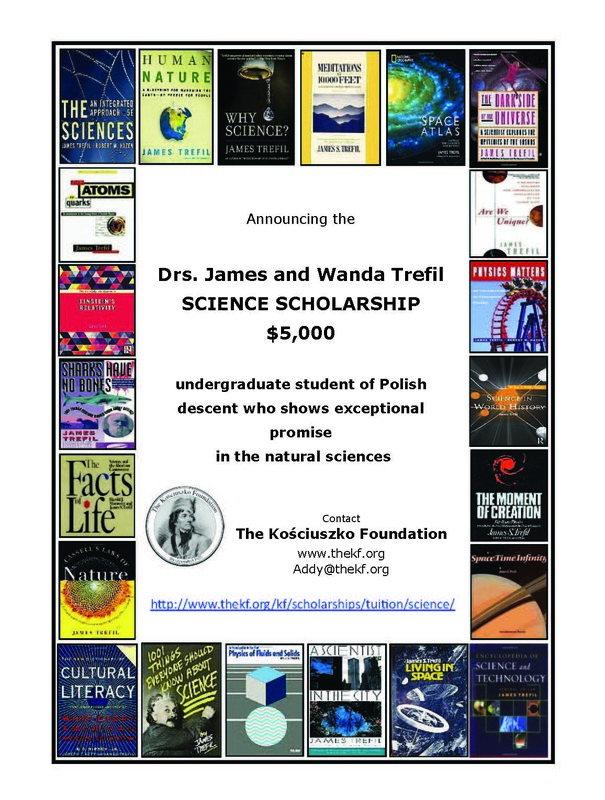 The Kościuszko Foundation administers a $5,000 scholarship for undergraduate students of Polish descent.